View MKE: The back Yard Rendering. Rendering by Dan Beyer Architects. 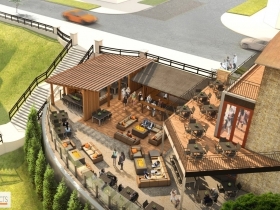 MILWAUKEE (August 20, 2018) – VIEW MKE, the new neighborhood restaurant perched at the top of Historic Brewer’s Hill, is set to open its newly constructed patio on Thursday, Aug. 30. 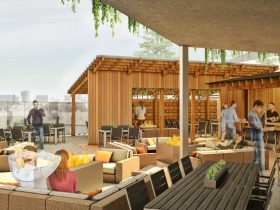 The large patio – dubbed “The Back Yard” – will offer an unmatched Milwaukee outdoor dining experience, allowing guests to enjoy panoramic views of the city skyline while savoring the restaurant’s globally inspired shared plates. Carl Tomich, who co-owns the restaurant with his wife, Kim, said the patio will open in time for the Harley-Davidson 115th anniversary celebration and the Labor Day weekend holiday. The space seats about 100 and includes an expansive outdoor bar area with table seating throughout, along with casual sofas and fire pits for socializing. The Back Yard will offer the restaurant’s regular dinner and brunch menus during those service hours, as well as light snacks and beverages from 2 to 5 p.m. seven days a week. Reservations are available by calling (414) 763-0003 or online at www.viewmke.com/reservations. Bloody Mary cart. Photo courtesy of View MKE. Tomich also said that VIEW MKE has made some special enhancements to its weekend brunch offerings, which have been extremely popular since the restaurant opened its doors in June. 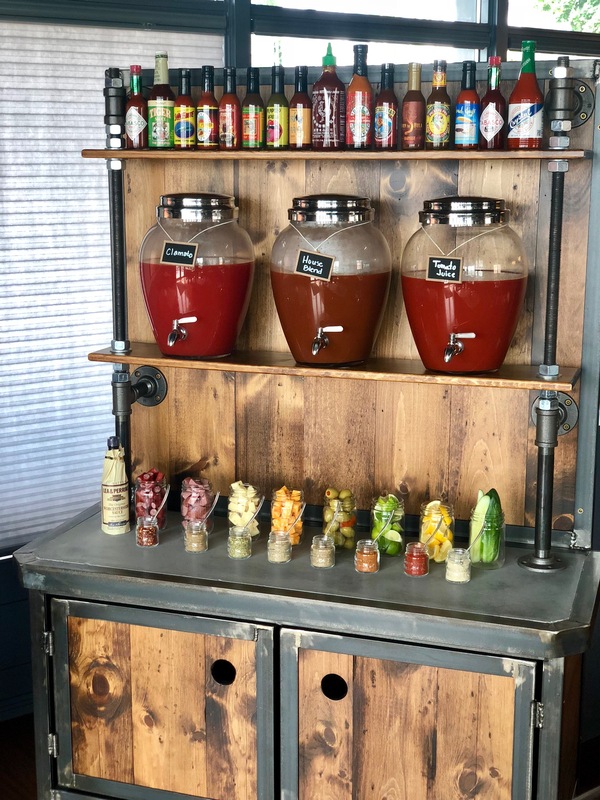 A Bloody Mary cart, where guests can create their own concoctions from a variety of hot sauces, spices, vegetables and other garnishes, will be available during Saturday and Sunday brunch hours. Additionally, the restaurant will add glasses of Veuve Clicquot’s rosé champagne to the menu – in addition to Veuve’s yellow label champagne – in celebration of the 200th anniversary of the rosé. Restaurants typically sell the luxury champagne by the bottle only. Open since June and inspired by its expansive view of the city, VIEW MKE, is a nod to the chef’s point of view in the creation of menu items inspired by flavors from local, regional and international cuisines, as well as the restaurant’s take on Milwaukee’s casual lifestyle and dining experience. Executive Chef Zach Panoske and General Manager Andrew Ruggeri bring together a broad range of culinary experience to VIEW MKE and a modern twist to techniques, flavors and spices from Italy, Spain, the Basque Region, the Philippines and other corners of the world. The Milwaukee vibe is evident throughout the restaurant and includes iconic images of Milwaukee created by Wisconsin artists and large format images from local photographers. 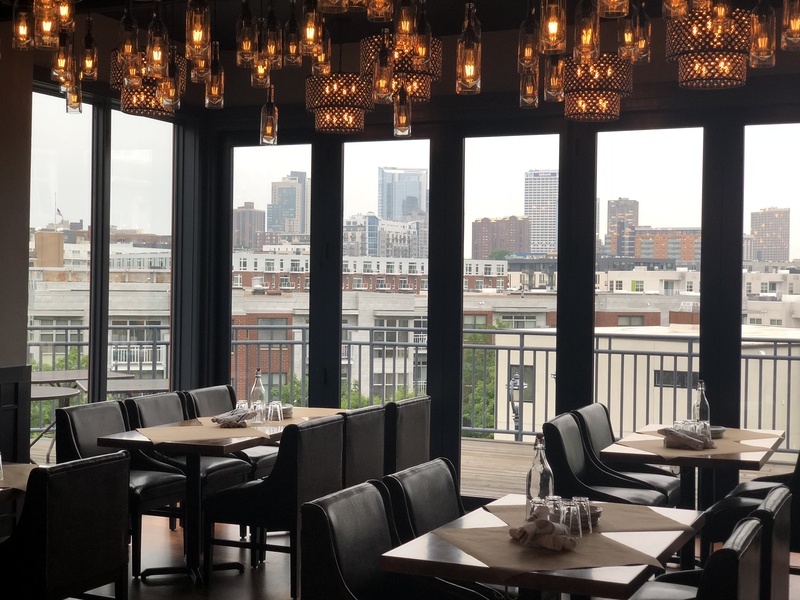 The upstairs dining area opens to the new patio with 18-foot folding glass doors providing an unobstructed view of the city’s skyline. Hundreds of Edison bulbs create a soft glow through the restaurant and the industrial feel extends to the lower level where the bar has been rebuilt and custom booths installed along with a cubist mural of the city by a local artist. Monday through Thursday: 5:00 p.m. to 10:00 p.m.
Friday and Saturday: 5:00 pm. to 11:00 p.m.
Brunch served Saturday and Sunday 10:00 a.m. to 2:00 p.m.
For more information, visit VIEW MKE at www.viewmke.com, on Facebook, Instagram and on Twitter. View MKE to Offer Globally Influenced Cuisine with a Local Point of View at 1818 N. Hubbard St.